VS: Hi Bern. I’d like to start our dialogue with a personal question for you, so as to understand more about your installation, Dead Reckoning, and what it means to you. Who is Bern O’Donoghue, and why does she care that people are dying at sea in boats? VS: That reminds me of Martin Luther King’s statement that “justice is indivisible”. He says that we cannot think about justice for ourselves without paying attention to justice for others. I find this insight very important and it has been background inspiration for our research on the project Crossing the Mediterranean Sea by Boat, which looks at the struggles of people who are move under precarious conditions. For me, producing work with a view justice for all is critical because it disrupts the tendency for us to perceive our lives in isolation from others. This tendency could be understood as a ‘root cause’ for xenophobia, which I see as closely connected with an economic rationality and a colonial tradition that divides people from each other and discards those deemed to be unworthy. Scholars like Achille Mbembe talk about this in terms of ‘disposable lives’. Is this a helpful way to describe what the boats in the Dead Reckoning installation represent for you? BO’D: ‘Disposable lives’ is a very apt term if we look at the collective ambivalence that is shown to the deaths of refugees and migrants at the borders we’ve created around Europe. Each boat in Dead Reckoning 2016 represents an individual who has been recorded as drowned last year in the Mediterranean Sea en route to Europe. I use data collected by IOM in their Missing Migrants Project. Every one of the 5,083 paper boats symbolises a loss of someone significant: a daughter, son, neighbour or friend. 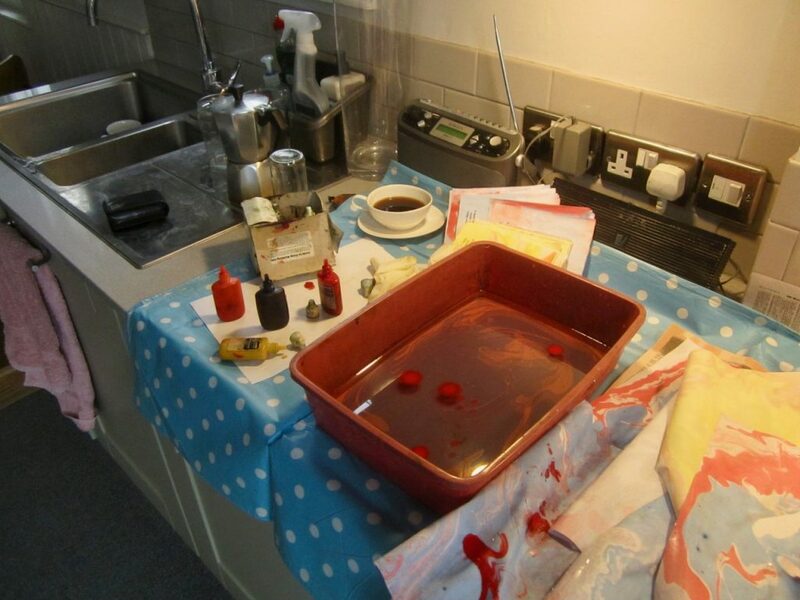 I’ve deliberately chosen to work on the project in my kitchen, where my own family gathers most, using water and fragile materials to construct a work which identifies some of the most basic similarities we share with refugees and migrants. Throughout 2016 I hand marbled and dried hundreds of pieces of A4 paper, before turning them into tiny origami boats. I used twelve different colour combinations to marble the paper to more clearly depict the loss of life month by month, highlighting how changes such as weather, season or policies surrounding migration in Europe might affect the number of people who have died. VS: So, you literally make your work in your kitchen to draw connections between your daily life and relationships, and those of the people on the move who your artwork represents? That is really interesting because it brings the experiential dimension ‘back home’, so to speak. Academics examining migration and more broadly working across the social sciences have done a lot of analysis of the meaning and significance of home over recent years, and have also increasingly paid attention to the importance of understanding the experiential dimensions of migratory journeys. This is also something that our project seeks to draw attention to – the experiences of people on the move. 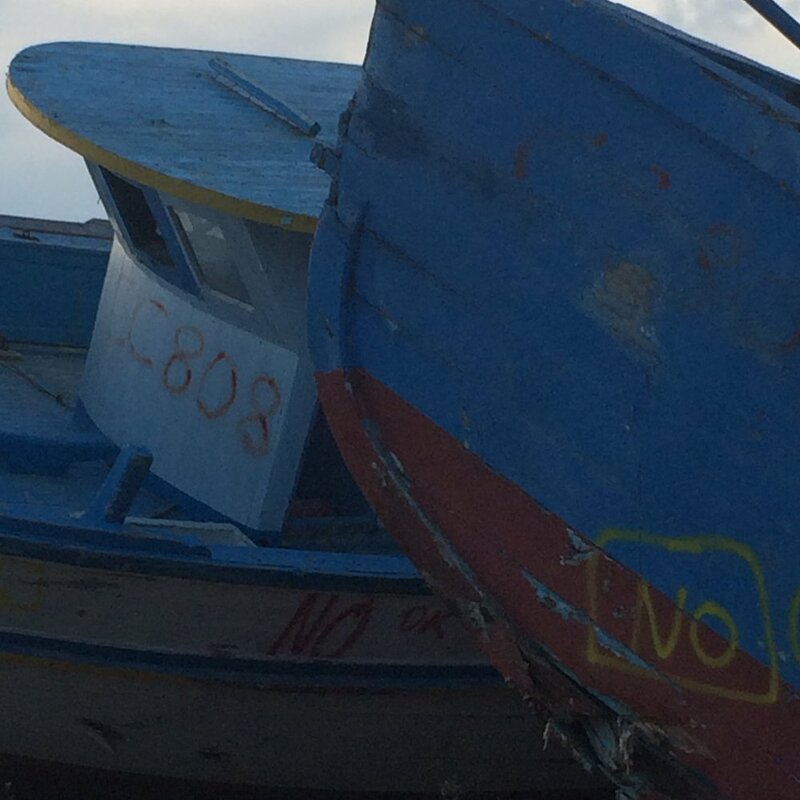 By focusing on these experiences, we seek to re-humanise people making the journey across the Mediterranean Sea in the face of dehumanising policies and media coverage that so often dominate. This is not only a driving concern of Crossing the Med, but also another project I am working on, called Human Dignity and Biophysical Violence, which looks at the ways that border deaths are tolerated – and even produced – by policy and the collective ambivalence that you mention. I am particularly concerned here in the ways that, despite occasional rhetoric to the contrary, respect for the dignity of each person’s life is wholly disregarded in Europe’ current agenda on migration. So, what was the driving force for you to carry out Dead Reckoning in its current form? BO’D: I originally began this project mid April 2015, when two news reports six days apart showed that boats carrying refugees had capsized off the Libyan coast. I was stopped in my tracks by the fact that 1200 people had drowned. It was so shocking and distressing such a huge number of people had died in this way, but equally troubling was the pejorative language used by certain politicians and sections of the media in response to the accidents. I found it disturbing to see numbers used as a means of distancing people living in safety from the human tragedy and felt compelled to make some work to bridge that distance and began researching the refugee crisis. As the crisis continued to unfold, living and dead seemed to be afforded little dignity or compassion. The language was coarsening by the day, which was frequently overwhelming. I started marbling paper with no clear idea of how to it might be used, other than I intended to make something reconnecting the viewer to the humans hidden behind statistics. Folding the paper into boats came from thinking about how vulnerable people were in the sea. As summer approached and deaths increased, thousands of boats amassed around our home and discussion in the news became ever more polarised. All I could think was, ‘These are all someone’s son or daughter’ and began marking each boat with a relationship to another person. By this time I realised that I wanted to campaign for safe passage and to use my work to challenge myths surrounding the refugee crisis. VS: That resonates a lot with our concerns. In Crossing the Med we also wanted to challenge the assumptions that misrepresent the journeys, lives and aspirations of people on the move. We decided to carry out in-depth interviews with people making the journey across the sea so that the complexity of different stories could be documented. More than this, we also wanted to give people arriving to the European Union the chance to share their stories in a way that could in some way counter the dehumanising treatment the faced along the journey and on arrival. Of course, we don’t want to overstate this, yet giving people time and space – not only to share their stories but also to voice their concerns and demands – has proven very powerful in various ways. Rather than numbers, our research is about stories – not the stories of victims but the stories of people who can and do speak back to policy makers and ‘host’ societies to challenge some of the assumptions that lead to detrimental policies and negative societal responses in the first place. It’s not a comfortable process to go through, to sit face-to-face with the people that we interview or to look at the data that our research is producing, but we still think it is important. 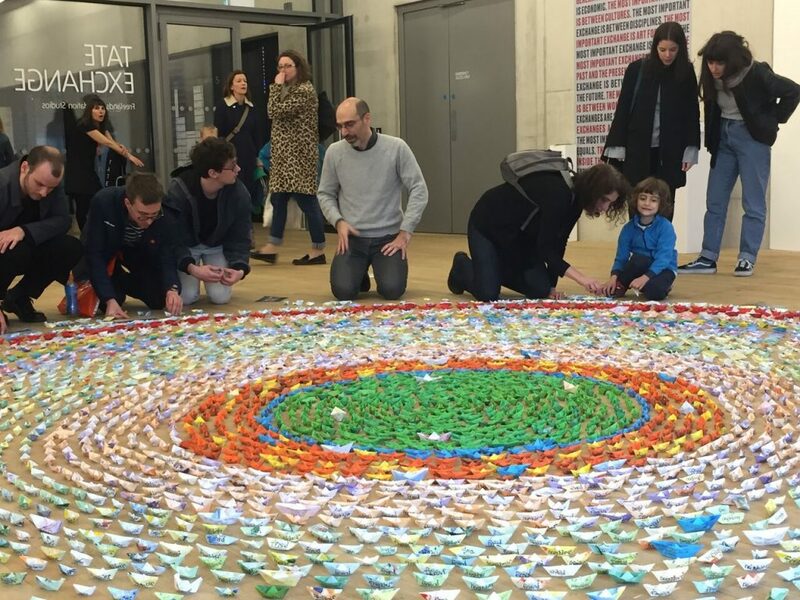 Can you say a bit more about how making and installing the paper boats help you to deal with the horror of increasing numbers of border deaths – not only at sea but also across other sites across and beyond Europe? BO’D: That’s a hard question…. there are times when I don’t feel it helps me at all! Looking at deaths in the Mediterranean has produced so much work so far, I feel as if I’ve only just begun to scratch the surface. It’s very wearing to think continuously about trauma so drawing for it’s own sake in the studio can sometimes seem incredibly tempting, but I have a sense that watching terrible events unfold and feeling anger or sadness and not using that energy to help in some way is a waste of that experience. So, I make Dead Reckoning and engage in widening the debate. As an artist, I’m in the privileged position of being able to look at challenging ideas and present information in a manageable way. It seems reasonable that if I ask my audience to engage with the installation and experience difficult feelings, I too must be prepared to feel some of those difficult emotions, else how can I expect them to? How I feel, how someone terrified in a boat feels, how someone unwilling to help refugees feels, can all be imagined and channelled alongside presentation of the facts to interrogate and understand the overlap of ‘us’ and ‘them’. These are the components of the creative toolkit I use in Dead Reckoning in an attempt to foster connection, so that empathy and nuanced discourse might follow. VS: That’s very interesting. This question of how to engage emotions – not avoiding the discomfort it involves but mobilising and productively transforming pain and anger – is an idea I started exploring in my last book, Post/Humanitarian Politics Between Mexico and the US. I was looking at different humanitarian responses to migrant deaths in the desert in the US, and I found the work of scholars such as Miriam Ticktin on the politics of care, and Claudia Aradau on the politics of pity, very important as critiques of humanitarian politics. Since humanitarianism involves an unequal relation between people who are privileged (that is, humanitarian actors) and those who are not (people actually undertaking the precarious journey through the Sonoran Desert), it is highly problematic. But I was also interested in the ways that some humanitarian actions involved anger rather than pity, or simply respect for the life and demands of another. Does this involve a different type of politics, that acknowledges a position of privilege while also challenging such privilege through actions orientated to taking responsibility for – or enacting an ability to respond in the face of – border deaths? This is an important political and ethical question, I think, and signals the importance of considering what compassion means when it is orientated to empathy and respect, rather than to sympathy and pity. 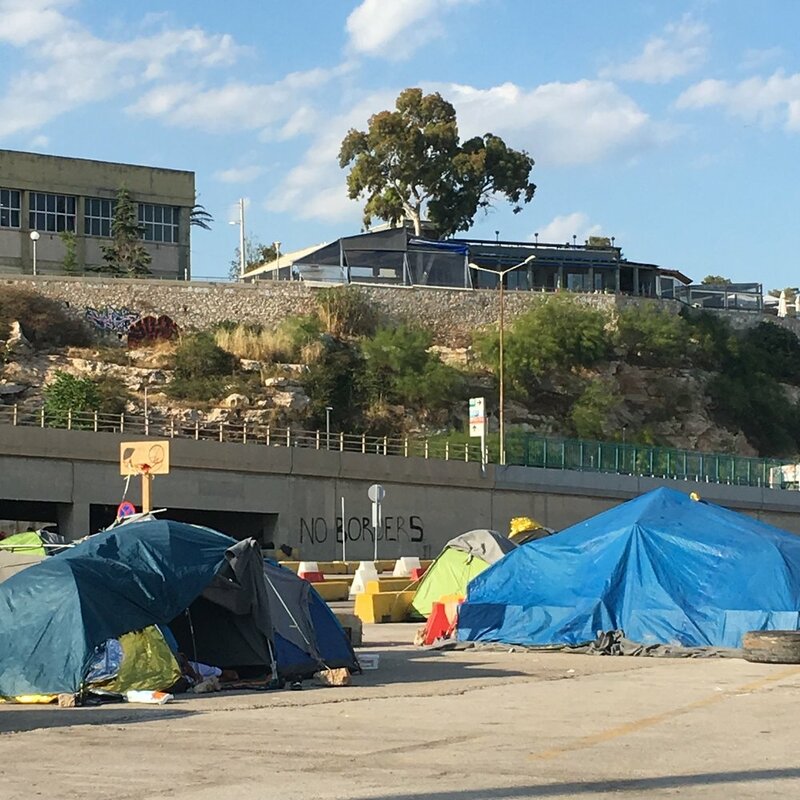 Through your work, what have you discovered that helps you to make sense of the inhumane European response to people moving in precarious conditions, and how? BO’D: I’ve found there’s a huge problem with the kind of ‘news’ that’s churned out about refugees and migration. This has become obvious from my own research on the issue and how some members of the public have discussed the installation. Basic facts are just not getting through often enough in the mainstream media. Though real information is out there, too many politicians and outlets present biased or inaccurate perspectives as truth. I enlist help from members of the public and as we attempt to build the installation I ask participants about their experience of and thoughts on migration. Many of the negative things I hear come from people quoting incorrect or misleading articles, which reinforce their own worldview. We touch on the possibility that if we needed to escape death, precarious living or poverty, how without doubt we’d all make the same decisions as refugees or migrants – hard to acknowledge when feeling anxious about your own situation. The West has been insulated for quite some time from problems in other parts of the world. Now, as we struggle to deal with the impact of our own financial issues and so many arrive on our shores asking for help, it’s easy to see how the needs of outsiders can feel too much to take on. Politicians are both role models and set the tone for the electorate, so if they choose to reinforce borders and be economical with the truth about migration as opposed to presenting a balanced picture or defend the rights of refugees, it’s hardly surprising that public opinion hardens too. It is a very normal response to push away other people’s misfortune and focus on self-interest when under pressure, but legitimate concerns about employment and the pressures locally are not the fault of migration or refugees. Too often there is a lack of political courage to say this or to speak out against populism, which emboldens the far right groups to exploit anxiety and conflate refugees with terrorism. VS: That’s a good point. There is now a long history of approaching migration as a security issue linked to terrorism. In my PhD – which I did a long time ago now! – I looked at the ways that asylum seeking in the UK and across Europe was presented as a security problem post-9/11. But even at that time I was very struck by the work of International Relations scholars such as Jef Huysmans, who point to a longer history of what is called in political science ‘the securitisation of migration’. I think that we can see the legacy of this history today in policies such as Trump’s recent attempt to ban the entrance of refugees to the US, as well as in EU efforts to prevent migrants from entering the territory of states within the Union. Of course, we have also seen this in Brexit debates in the UK, highlighting the problematic legacy of irresponsible linkages of migration, terrorism and more general concerns about ‘foreigners’ as ‘threatening others’ over a number of decades. When you have dialogue with people through Dead Reckoning, what sort of responses do you get? What is the most negative/positive reaction that the exhibit provoked and how did you deal with this? VS: It is really interesting hearing you talk about this. As a research team we often feel a pressure to make an ‘impact’ on the audiences of our research – and of course, policy makers are often a prime audience for social scientists. Crossing the Mediterranean Sea by Boat has taken its particular point of departure the European policy agenda, and we have done a lot of work to try to point to the problems of the assumptions that this involves. For example, our evidence does not support the assumption that deterrent policies work, and rejects the divide between political and economic (forced and voluntary) migrants. This resonates a lot with what you are talking about, and from the start we wanted to reach wider audiences to challenge the assumptions that inform bad policies – in particular by raising awareness of the impact of such policy on the experiences of people on the move. We emphasise that without taking these experiences seriously, policies will continue to fail. It is serendipitous for us that this opportunity to collaborate with Dead Reckoning arose, because it helps us to reach wider publics as we have always wanted to do with this research. We have developed an online story map to facilitate this, where people can follow individual journeys to understand more about the complexity and challenges of migratory experiences. BO’D: I’m looking forward to using the interactive map with the installation. It will be interesting to see how visitors respond to the stories of real people when confronted with the thousands of boats. It’s a gentle reminder again that every one of those people who’ve died have a story about why they leave and why they’re significant. Collaborating with Crossing the Med as part of Who are we? feels like a very natural fit for many reasons. As a starting point, we both look at border deaths and want to see change. I want to draw attention to our ambivalence in Europe towards refugees and migrants. What does that mean for us as civilised human beings? Your work attempts to make sense of how of death has become a normalised dimension of border control in privileged regions. We both want to see this transformed and through collaboration we might find a way of communicating the benefits gained by this. I want to develop work with Crossing the Med which explores the mutual value of connection and empathy outside our immediate circles. I’m looking forward to finding ways of bringing to a wider audience the stories the project has collected and show the benefits of interdependence. When I first started this project, I envisaged a year’s work, maybe two, but the more I uncovered, the more I felt this might be the focus of my work for many years to come. Now Brexit, Trump and the rise of the far right are amplifying tensions felt around the world, there’s even more need continue tackling myths and presenting data in accessible forms. BO’D: My pleasure, I look forward to working together in the future!